Being a huge fan of Abalone and a fervent follower of Ah Yat Abalone Forum Restaurant ( 阿一鲍鱼富临酒家 ) since more than 20 years ago, naturally I was thrilled when they finally launched their VIP card couple of years ago. The restaurant also carries their own brand of abalones now and I am loving it. The Ah Yat Ji Pin Canned Abalone comes in both fresh and braised versions. Personally, I prefer the Braised Abalone ( 阿一红烧鲍鱼 ) as the sauce is much richer. It was my mum's 87th birthday and like me, she is a sucker for these gourmet shellfish too. Hence, I came up with this Enticing Steamed Baby Abalones on Winter Melon with Conpoy and Enoki ( 瑶柱金菇白玉鲜鲍 ) that is too good to miss. 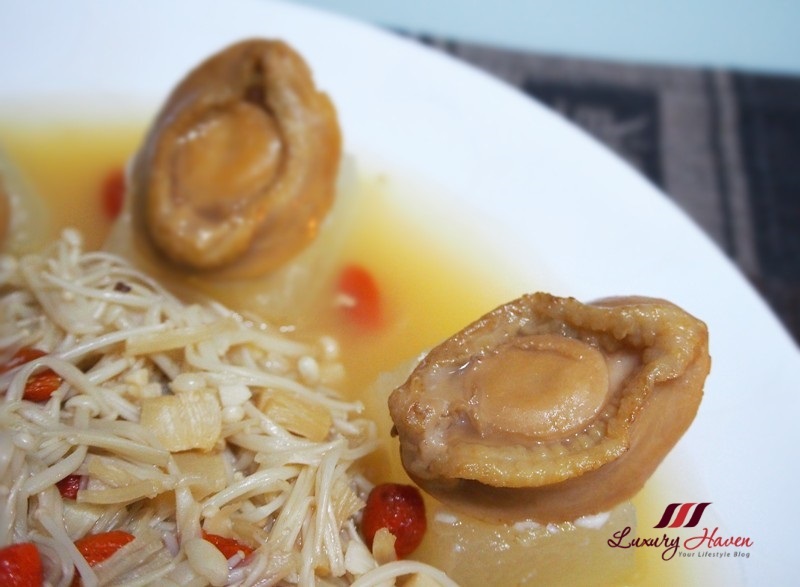 The soft and tender Winter Melon ( 冬瓜) stuffed with fish paste simply melts in your mouth, and the chewy texture of the Ah Yat Braised Abalones ( 阿一红烧鲍鱼) along with the strings of Dried Scallops (干貝 / 瑶柱 ) and Enoki Mushrooms (金菇), enveloped in the mouthful of abalone sauce makes this an epicurean dish that's fit for an Emperor! I have also added Goji or Wolfberries ( 枸杞子) to tease the eye as well as to draw the medicinal benefits from the wonder herb. 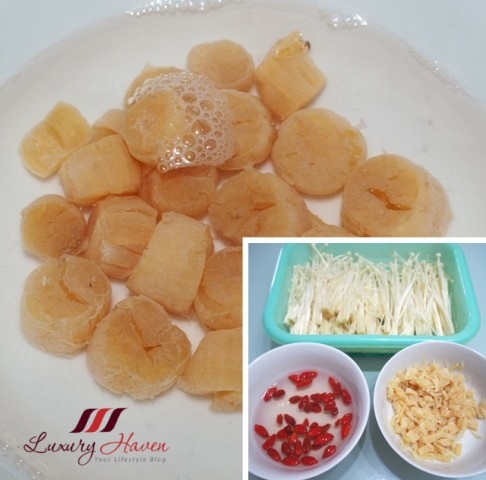 Chop off the ends of the enoki mushrooms and rinse thoroughly. Soak conpoy and wolfberries till soft. Shred conpoy. 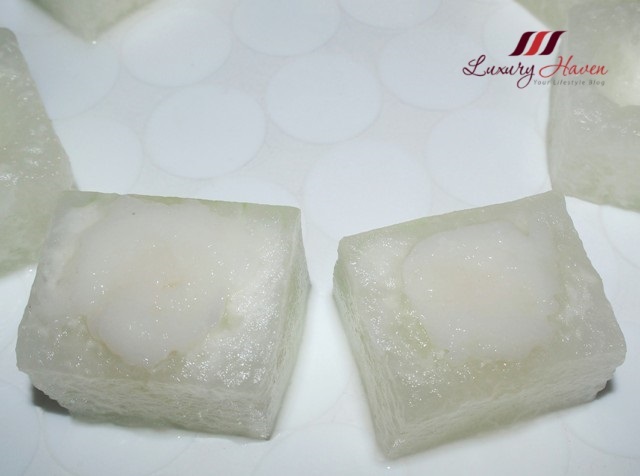 Cut winter melon into squares. Using a melon baller, make a dent in the melon enough to fill in fish paste. Don't throw away the excess melons after cutting the cubes. Use them to make a delicious soup! Fill the melon cubes with fish paste. The purpose of this is to hold the abalones in place. 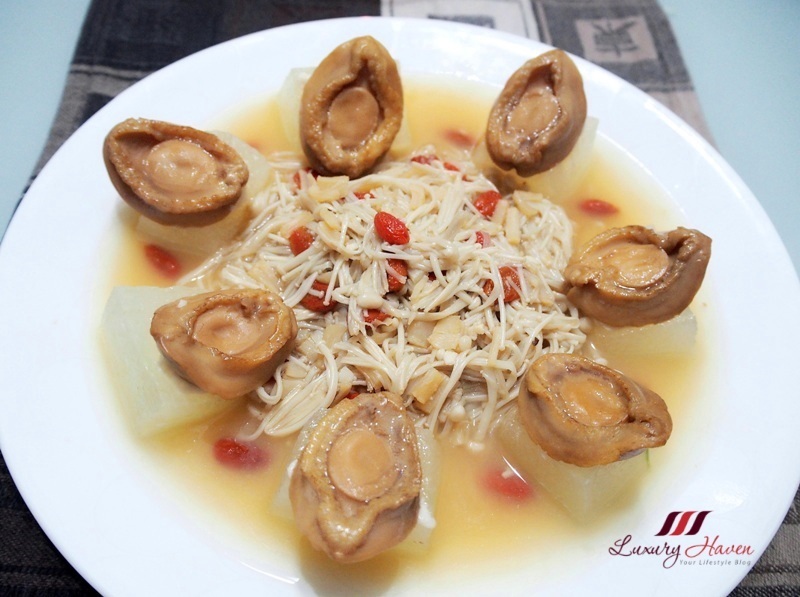 Place abalones on melons. Cover loosely with cling wrap and steam melon till soft, either using microwave mode or traditional method. About 5 minutes. Heat oil and saute garlic till fragrant. 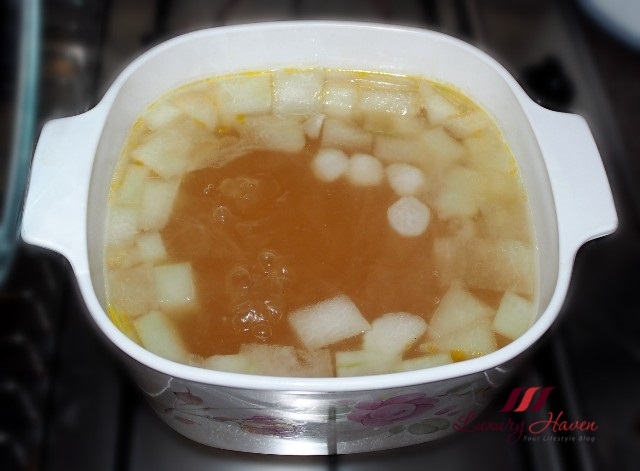 Add conpoy, abalone sauce, chicken broth, excess juice from steamed melons, and simmer for about 3 - 5 minutes. Add enoki and goji. Continue to simmer for another 2 minutes. Stir in cornstarch and add wine. 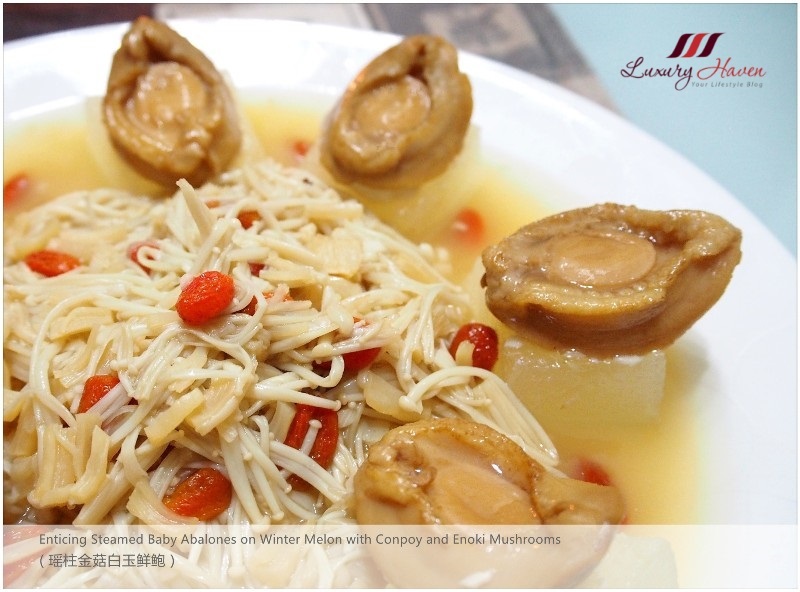 Your Enticing Steamed Baby Abalones on Winter Melon with Conpoy and Enoki ( 瑶柱金菇白玉鲜鲍 ) is ready for the Emperor! 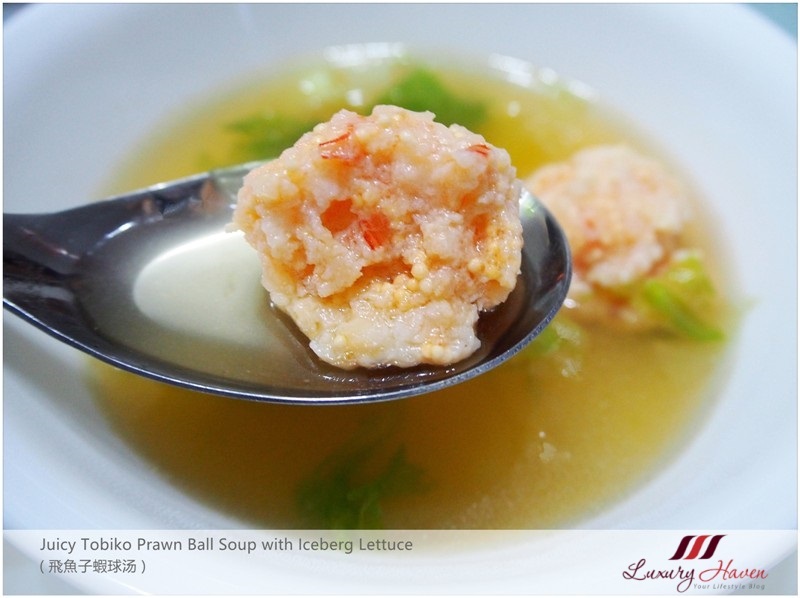 Here is the soup I made with those excess winter melon: Juicy Tobiko Prawn Ball Soup with Iceberg Lettuce ( 飛魚子蝦球汤 )! Hummm! Fiquei com muita vontade! Wow, your family is truly blessed to have you cooking these restaurant-worthy dishes for them to eat. I can only imagine how tasty they are. Awww! This is such a beautiful dish for your mum by her creative chef daughter. 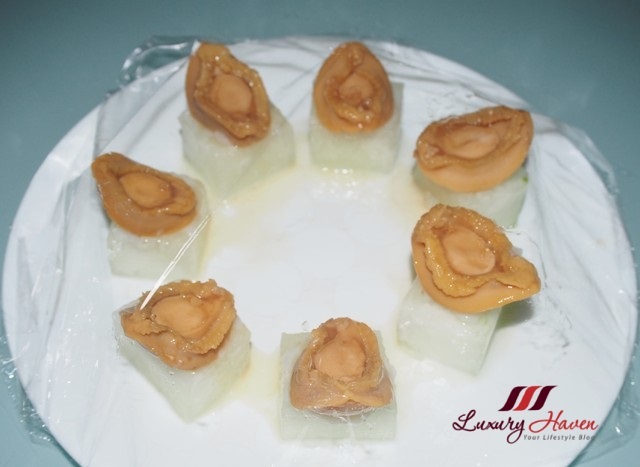 The abalones looked so great sitting on winter melon cubes! Empress Dowager Cixi would have loved this too! One word to sum up - loveable!! I really love this dish! Many ingredient we cannot find in Tunisia, but that lt me remember that Singapour is a great culinat city. Thank you for letting us discover new recipes via your blog! Brilliant idea to hold the abalone with the fish paste... it not only holds well but also make the winter melon tastier. omg this looks so so good! Your cooking skill is so great! What a nice treat for you mum's special day! What a delightful dish for your mum. Yum yum. I'd like to learn how to use winter melon in more recipes. It's a relatively new veggie for me. I bet it must've been tasty, Shirley! I'm not sure if we are able to find affordable winter melons in Adelaide, though. 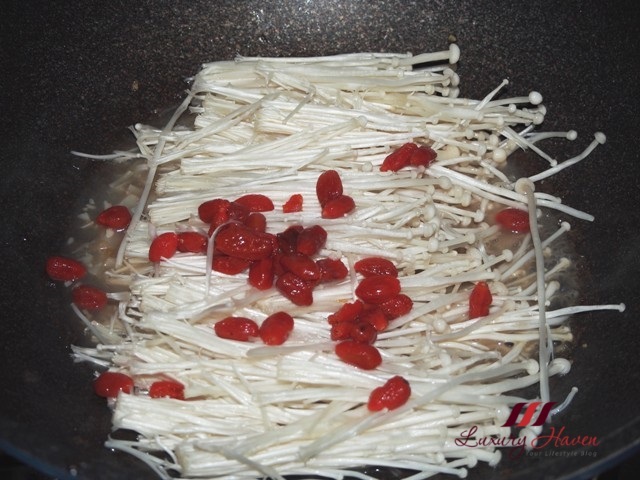 I don't eat snails but the enoki mushroom, winter,melon and goji berries all sound wonderful to me. Your cooking like like an art, So much perfection in everything. Oh my, this looks like it's straight from the restaurant kitchen, it looks so delicious! Looks and sounds absolutely delicious Shirley! My family both enjoys mushrooms and winter melon and who doesn't like abalone in singapore! (specifically us chinese folk) I love my melon usually in a soup but braised and for a main dish is totally up my alley too!